Thanks to our state-of-the-art treatment facility at our Morwell, Victoria location we are able to treat most of our timber ourselves. We can also treat timber for you to the hazard levels outlined below. 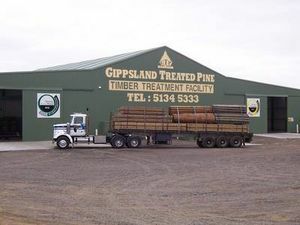 Enquire today to our Morwell branch about any timber you would like treated. We charge per cubic metre for custom timber treatment. We can treat small or large quantities of timber for you. We can offer H3 - H6 level treatment in CCA preservative and H3 - H4 in ACQ preservative. Please contact us for our rates on custom treating. This preservative is commonly used in decking, handrail, playgrounds, gardens and picnic tables. ACQ is the new non-arsenic, non-chromium based preservative.